Welcome to the luxurious and inviting Hale Yangkey (House of Happy Melody) at the Hanalei Bay where you will enjoy golden sand beaches, gentle trade winds, and beautiful sunsets on the north shore of Kauai. 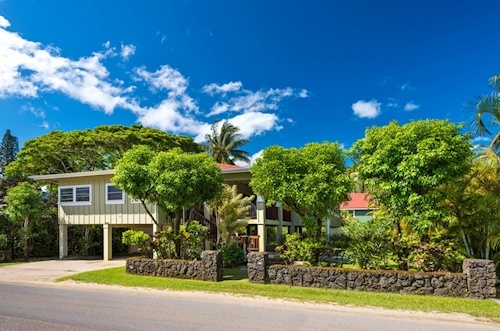 This elegant new vacation retreat with its high ceilings and rich cherry wood floors offers the perfect combination of immaculate old world Hawaiiana decor and modern features. Close to town and the beach. Two Master Suites with California King beds and private baths with double sinks. Third bedroom has two twin beds. A fully-equipped gourmet kitchen with top-of-the-line appliances and granite countertops is perfect for intimate meals or large dinner parties. TVs, DVD/CD players, Satellite TV, and iPod docking stations. Other amenities include: private outdoor shower, gas grill, Wireless High Speed Internet, laundry room, top quality linens, and oversized beach towels. The home accommodates up to 8 guests. The Hale Yangkey house is a 10-minute drive to Tunnels, one of our finest seasonal snorkel and surf locations, and a few more minutes to "the end of the road" at Ke'e beach and the start of the breathtaking Kalalau Trail and the famed Napali coast. Princeville is 5 minutes from the house and offers golf, zip-lining tours, horseback riding, jungle waterfall kayak trips, shopping, and more. $5000 security deposit or $59 nonrefundable damage insurance. “Gorgeous house, fantastic location. My husband, our toddler, my mother in law and I had an amazing vacation here and I would come back in a heartbeat. The house is extremely spacious and would have comfortably slept a larger group. It was also very safe for a toddler/younger children which was a concern for us with a 1.5 year old (there are no internal stairs, the stairs up to the lanai/entry are securely gated, and the lanai is surrounded by secure railings). “Our stay at Hale Yangkey in Jan, 2016, could not have been better. It is a beautiful home in the perfect island style, with spacious rooms, beautiful hardwood floors, nice, comfortable furniture, and a complete gourmet kitchen. The living quarters are on a second floor, with large garage underneath, so ventilation is excellent and very cool. Flat screen TVs in every bedroom, great, updated bathrooms (the master is huge), this house was great for our family of five. Hanalei beach, one of the most beautiful in the world, is literally a three-minute walk from Hale Yangkey; and the restaurants and bars of Hanalei town are easy walking distance. Our favorites are Hanalei Gourmet (ask for a gin "Crush" from the bar), Kalypso and Tahiti Nui (casual), and The Dolphin (more upscale- wonderful teriyaki ahi, the specialty). The house is large (we could have had a party for 30 people--we didn't) and has a great, private lanai for relaxing or serving a meal. The house is so close to the beach that it was easy to carry a bottle of wine to the beach to watch the sunset, or take an early morning walk on the beach before breakfast. The weather was fantastic for our stay during early Jan, lots of sun and cool temperatures at night.